Participants of the African American Board Leadership Institute governance training gather at the U of R’s Burbank campus April 6 and 7. 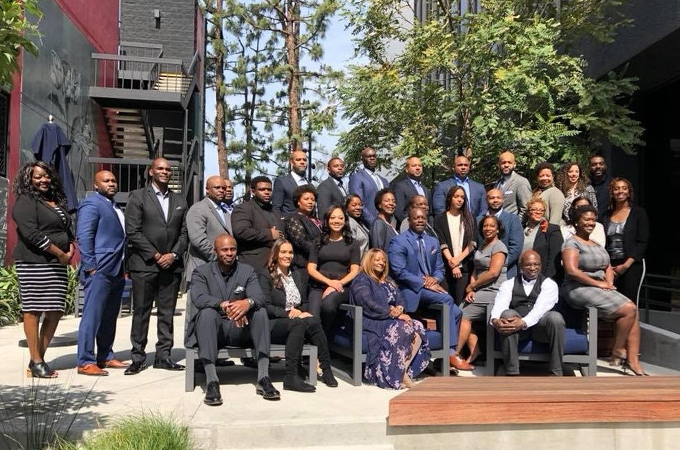 University of Redlands’ Burbank campus hosted the African American Board Leadership Institute (AABLI) Board Leadership Program last Friday and Saturday. This training was designed for professionals who have or currently serve on boards and want to increase their effectiveness as organizational leaders. The Bulldog Blog asked Burbank Campus Director Pamela Allen to tell us more about the event. Bulldog Blog: What does hosting the AABLI event mean to the U of R? Pamela Allen: We are always looking for ways to get the word out about the University of Redlands. What could be a better way to do that than hosting a group of individuals interested in assuming community and corporate leadership roles through board membership? In addition, partnering with AABLI, whose primary purpose is increasing representation of African Americans on governing boards for both public and private entities, is aligned with our commitment to increase diversity and access to underserved communities. Diversity gives organizations the opportunity to be better aligned with the communities they serve, improve decision-making, and expand networks of dedicated talent. BB: Have you worked with AABLI before? PA: This is my first time working with AABLI. However, I do know that many African American professionals have completed this training and, as a result, are now serving on prestigious boards. AABLI alumni are serving on Girls Scouts of America, Los Angeles County Office of Education, and the Los Angeles County Small Business Commission, to name a few. BB: What specific topics were covered as part of the training? BB: Does the partnership with AABLI extend beyond hosting the governance training? PA: Yes, the U of R School of Business is extending a tuition discount for AABLI alumni, as well as their spouses or domestic partners, for programs offered at any of our regional campuses throughout Southern California. Whether adding skills for career advancement or following a lifelong passion, AABLI alumni and family members can take advantage of all offerings from the School of Business, School of Education, and School of Continuing Studies. The School of Business in particular is aligned with the needs of AABLI’s alumni by offering the Master of Business Administration, Master of Arts in management, and the Bachelor of Science in business degrees at our seven regional campuses throughout Southern California; these programs focus on teaching 21st century business skills. Additionally, we are promoting AABLI’s board leadership training programs to School of Business alumni and current students. BB: How can someone sign up for an AABLI training? PA: Go to AABLI’s website, which contains all of the programs offered as well as a showcase of the Institute’s alumni. BB: Where would AABLI members go for more information about U of R’s programs? PA: Additional information on specific programs is available on the websites for U of R’s School of Business, School of Education, and School of Continuing Studies.